As Korean K-pop continues to spread worldwide, there have been an increasing number of inquiries on how to take part in TV music programs produced by major broadcasting companies in Korea. Music programs are incredibly popular since audience members can see a number of their favorite singers perform all in one place. One big bonus is that, unlike concerts, tickets are free to those who apply online and are picked in the lucky draw. Let’s take a look at how you too can apply for tickets from each broadcasting company and attend some of your favorite TV music shows! 1. To apply to be part of the studio audience of the Ingigayo program broadcast live on SBS you must first sign up on the official site of SBS (Seoul Broadcasting Station). You will need your alien registration card (issued in Korea) and your alien registration number. It is best if you can speak some Korean or if you can receive help with translation of the procedure and results. 2. Once you connect to the SBS Ingigayo website (http://tv.sbs.co.kr/gayo/), you will need to click on the “Studio Audience Application” (방청신청), the fourth menu item down on the left-side of the main page. Clicking on the “Studio Audience Application” (방청신청) option will connect you to a new page prompting you to log in. Type in your membership ID and password, and you will be led to the screen pictured below. Once you sign up on the SBS website, your membership information is saved in the ticket application page for your convenience. Simply check your personal information, choose the desired studio date, and click on the “Apply for Ticket” (방청권신청) button. 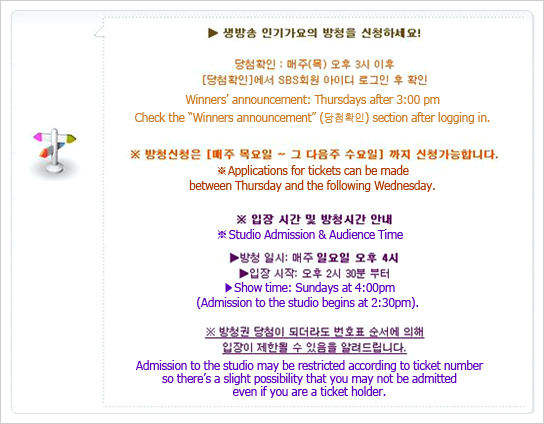 Tickets are given in sets of two and the winners’ announcement can be checked on the Inkigayo website every Thursday after 3:00 pm. You may print your ticket from the pop-up winners’ announcement notice if you have been selected as a ticket winner. You must present your ticket and ID at the studio on the day of the show in order to be admitted. Ticket holders who visit the SBS open hall in Deungchon-dong on Sundays before filming will be admitted to the studio starting from 2:30 pm. Admission and seating closes by 3:30 pm. ** Please note that all audience members must be 13 years of age or older. Photography and videotaping is strictly forbidden during the show. Any audience member caught taking photos or videos may be asked to leave the studio. You can apply for a studio audience ticket to the KBS Music Bank program on the official site of Music Bank after you sign up on the KBS (Korea Broadcasting Station) website. International residents in Korea will be asked to provide their alien registration number or passport number. Application for Music Bank tickets may only be made online between Thursday 9:00 and Friday 24:00 a week prior to airing. Winners’ announcements are posted Mondays after 17:00. On the day of broadcasting (Friday of every week), ticket winners should present their ticket reservation number at the KBS new wing open hall. All Music Bank audience members must be 15 years of age or older. Ticket holders younger than 15 years of age will be denied entrance to Music Bank. Each ticket winner will receive 2 tickets, so you must provide the name of your accompanying guest when applying for tickets online. Both guests must present a valid ID on the day of broadcasting in order to be admitted to the studio. On the day of broadcasting, your reservation number will be confirmed onsite and exchanged for tickets to Music Bank. Ticketholders will be admitted to the studio between 4:50 pm and 5:20 pm and any remaining tickets (standing room only) will be awarded to unregistered guests onsite between 5:30 pm and 6:00 pm. Ticket winners who do not line up and exchange their reservation number for a ticket by 5:00 pm will lose their seats. Admission for ticketholders will be closed promptly at 5:30. Among all the music programs in Korea ‘M.net M! Count Down’ is the most accessible for international residents and visitors. There is no registration process; guests are admitted to the studio on a first-come, first-served basis as space allows. You will need to get to the studio on the second floor of the CJ E&M Center in Sangam as early as possible to be guaranteed a seat. According to a fan site (although not specified on the station website), only the first 200 people will be admitted, so make sure to go extra early.